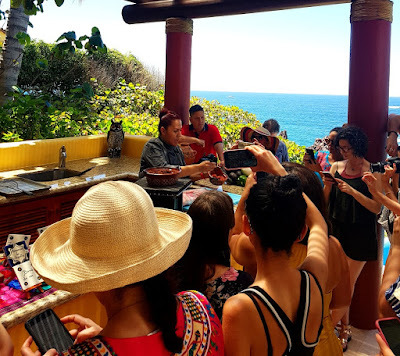 A gigantic media group came to explore Nayarit’s gastronomy during a press trip organized by the Riviera Nayarit CVB with the support of several other entities. The Public Relations Office of the Riviera Nayarit Convention and Visitors Bureau (CVB), in collaboration with various other entities, organized an important and very large press trip to promote the local gastronomy. The visit began on March 26th and ended on Friday the 31st. Juan Claudio Poblete, of the Revista Culinara Mexicana—the magazine that listed three of Nayarit’s eateries among the top 120 Best Restaurants in Mexico for the second year in a row—was one of the organizers of the trip, along with The St. Regis Punta Mita Resort, Four Seasons Resort Punta de Mita, Punta Mita Expeditions, the San Blas Hotel Association and the restaurant Emiliano Comida y Vino. Other media in addition to the Revista Culinaria included Gastrobites, the “Sibarita” section of El Financiero, “Menumanía” from Sección Amarilla, Forbes, Grupo Expansión, Aeroméxico’s inflight magazine, Travel + Leisure, Chilango, Life&Style, Animal Gourmet, FWD Travel, Trinche Estudio, Comensales, Epicuristas, Excélsior, El Gourmet magazine and channel, Revista Travesías, the “Buena Mesa” section for dailies Mural, Reforma and El Norte, Estudio Urquiza, New Worlder, New York Times Food, Munchies TV, Cocina y Comparte, Los Sabores de México and the “Mundo” and “Menú” sections of the newspaper El Universal. This huge group visited the Mercado del Mar in La Cruz de Huancaxtle, followed by a fishing trip around the bay. 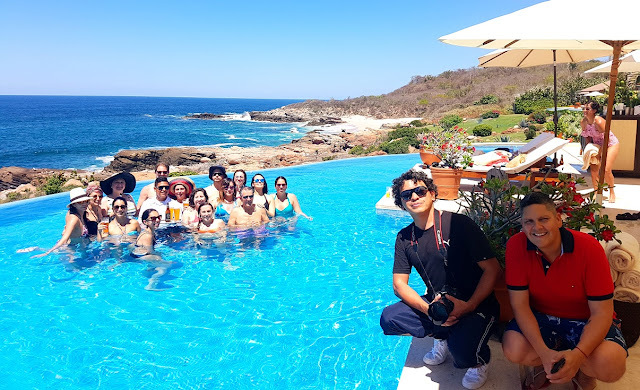 Afterwards they were in Punta Mita to learn about ceviches, mixology and to experience the Champagne Ritual at St. Regis. From there they enjoyed a meal at the hotel’s Carolina restaurant, one of the three mentioned on the list of the 120 Best Restaurants. After a yoga class, the group then went on to the Four Seasons to a pescado zarandeado workshop, followed by a spa session and cocktails at sunset. The next stop was San Blas, where Chef Betty Vázquez was waiting for them at her El Delfín restaurant at the Garza Canela restaurant, another of the aforementioned 120 best restaurants. The also visited the Contaduría, the Tobara and the Las Islitas beach in this historic port. As of press time the group is still in the destination with a pending visit to Tepic, particularly the Restaurante Emiliano, the third eatery on the list of 120. They will also enjoy a visit to the Historic Downtown area, the museums, the Cathedral and other cultural and culinary attractions. The will also visit Xalisco and Santa María del Oro before they conclude their trip.